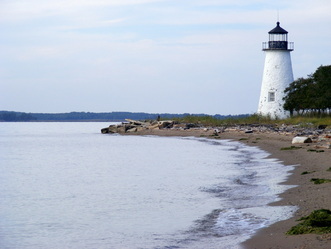 The oldest Maryland Lighthouse marks the the Northwestern Point of Pooles Island. Build in 1825 by John Donahoo and Simon Frieze, it is the first of Donohoo’s 12 Lighthouses. The fruitful isle was first marked for a lighthouse in 1824, when Congress appropriated $5,000 for a beacon on six acres of land. A conical tower standing 40 feet, six inches, the lighthouse is built from rough-hewn chunks of Port Deposit granite mortared together irregularly. The floor and foundation of the tower is made of cement, beneath which wooden pilings lend structural stability. The tower’s diameter is 18 feet at its base, narrowing to nine feet at the top. Inside the structure, a spiral staircase made of solid-cut granite blocks ascends to a landing. The cast-iron lantern, which comprises 12 ½ feet of the tower’s height, is cantilevered a few inches out from the mortared blocks. Stucco and whitewash were applied both to the interior and exterior of the structure. Improvements to the property commenced almost immediately. In 1828 Congress earmarked an additional $2,800 to build a fog bell tower. In 1857, at the behest of the newly established Lighthouse Board, a fourth-order Fresnel lens took the place of the old reflecting apparatus. In 1882, the keeper’s dwelling was upgraded by the addition of an extra story, which made for three more rooms. The Board reported that “...a new tin roof was then put on; the fencing was repaired and the lantern and fog-bell tower were painted.” Five years later a new front porch was added to the house, and a cow stable and poultry house were also built. In 1890, extra picket and post and rail fencing was put up, and this combined with the plank and brick walkways to make the pastoral setting extremely pleasant for the keeper. A boat house was added in 1892, along with a windlass to hoist up water craft. The lighthouse on Pooles Island lie dormant for some 50 years. In 1994 the US Army requested that it be entered into the National Register of Historic Places. This was done, and in 1997 work was begun to recondition the old lighthouse. The Lighthouse has been reactivated (inactive 1939-2011, now operated by the U.S. Army). The keeper's house has been demolished. It was abandoned when the improved channel was relocated from the west side to the east side of the island. The tower was partially restored and stabilized in 1997. In 2010, the Army carried out a more complete restoration including repairs to the masonry and lantern and installation of new, historically accurate windows. 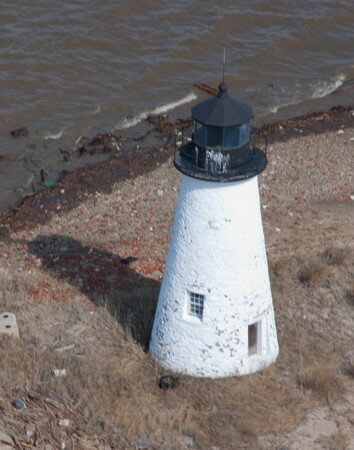 A solar-powered light was installed and the lighthouse was reactivated in September 2011 in time for the tenth anniversary of the 9-11 attacks. On September 5th, 2011, the retrofitted lighthouse (new solar lighting and lights) began sending out its new visual signature; four pulses, a pause, followed by 3 pulses. The old lookout tower that used to stand beside the lighthouse may still be seen in many old Internet photos. But it has fallen, although some rubble remains to mark the spot. Poole’s island was formerly used for bombing practice and is littered with unexploded ordnance and the site and tower closed. Owner/site manager is the U.S. Army Aberdeen Proving Ground. ARLHS USA-646; Admiralty J2298.7; USCG 2-8693. Poole's Island sits in the middle of the Chesapeake Bay, just north of the mouth of the Gunpowder River. Mapped at more than 295 acres in the early 1800's, the island has since eroded to less than 200 acres. 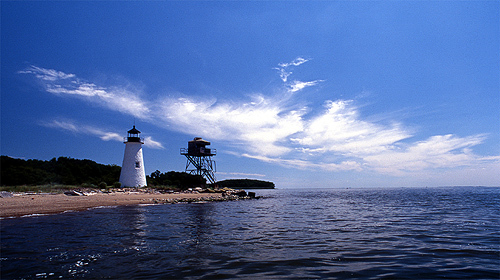 Poole's island was first visited by Europeans during John Smiths historic journey to explore the upper Chesapeake Bay. He named it Powel's island after Nathaniel Powell, a member of his party of explorers, and included it in his 1612 map. Over the years the name has undergone several revisions and you may find it listed as Pool Island, Pool's Island, or Pooles Island. It is speculated that the name changes may have come about as either a misunderstanding of the spoken word Powell, or perhaps intentionally to reflect the many fresh water pools the island contains. 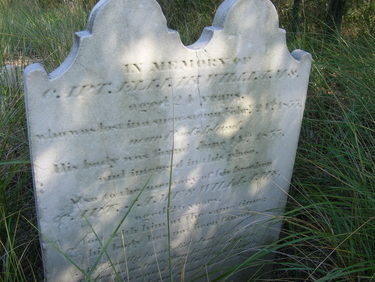 The Baltimore Sun lauded the isle around that time, noting that “numerous wells of clear sparkling water are scattered about the island.” The paper further commented that the water’s Ph was uniquely soft for the area and was very likely a factor in the prolific growth of crops and fruits. Prior to Smith's discovery, Susquehannock Indians lived on the island and harvested oysters from the surrounding waters. Some of oyster middens remain today and can be seen as rising mounds along the shoreline. In 1771 the island was purchased by John Bordley who attempted to make it a game preserve. Wild hare and partridge were imported from England to supplement the native deer and game birds. Later, during the Revolutionary War, a gunpowder factory was built on the farm by Bordley and he added a live stock farm. Both were built in support of the Continental Army. The 280-acre, narrow island was purchased in 1808 by Peregrine Wethered, who ran it as a slave plantation. Wethered grew a lucrative wheat crop and was very prosperous, so much so that his produce was hailed with “the wonder and admiration of the farmers all along the bay.” The soil quality was exceptional to say the least, and much like the water the dirt was said to be quite distinctive from soil found in nearby counties. Early pioneers in the region noted that while chestnuts and pine trees were found in large numbers on the mainland, these plants were completely absent from Pooles Island. War again broke out on the Bay in the early 1800s. During the War of 1812, Pooles Island was occupied by the British Navy which used it as a forward operating base from which it launched numerous raids on colonies on both the Eastern and Western shores. Troops that were sent ashore in the Battle of North Point were staged on Pooles Island. The island's mid-bay location and placement near the Gunpowder was also ideal for monitoring and interdicting local boat traffic carrying supplies to be offloaded at the head of the bay for overland transport to Philadelphia. After the 1812 war, the island reverted to private ownership. The ground on the island is said to be very fertile and the water of low pH, conditions ideal from planting fruit trees. Accounts vary, but somewhere between 2700 and 7000 peach tree saplings were planted on the island's northern end in large orchards. The owner, a Mr. George Merrett, boasted that Pooles Island was a "piece of Iowa soil in Maryland." This was true, because the soil produced abundant crops without the aid of fertilizers for many years. Peaches harvested from Poole's island became their own variety and were known as Pool's Island Best. Pooles Island was once the scene of an illegal but exciting prizefight that occurred in 1849. Maryland’s governor decreed that no steamboat captain could transport spectators to the event and even called up troops to make certain that his orders were heeded. Nevertheless, pugilism fans found their way to the island on oystermen’s skipjacks. The governor’s troops were unable to shut down the festivities as their boat ran aground, and reportedly the spectators waved to the soldiers as they sailed back after the fight. And they endured a watry death." In 1917, at the start of World War I, the Pooles Island property was transferred to the War Department. It, and other properties and islands nearby became the Aberdeen Proving Ground. The island, orchards, and all, were to become a testing ground for artillery and aircraft bombardment. Despite the destruction that occurred during the war years, the island is said to have actually benefited ecologically by the Army's stewardship. Today it is a sanctuary to many bird species and home to eagles, herons, geese, and osprey. A small herd of deer are now thriving on their island home.